Rye on the Prize is in the tradition of resinous red IPAs, but the rye inclusion gives it something a little different, almost a burst of citric acid-like abrasion that sits at the back of the tongue and makes subtle appearances that bursts with flavor but quickly moves on. An imperial red in style, the beer pours a dark amber tinge, almost a light brown really, capped with a foamy head with ample carbonation. 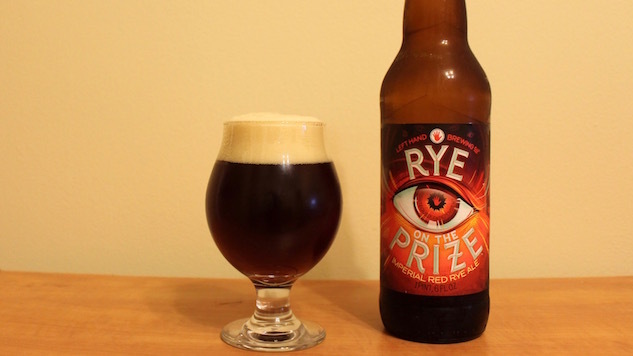 Unlike the red beers of old, Rye starts big on the familiar roast and semi-sweet malt but changes course for the Twenty-Aughts with an emphasis on big hops. It’s a refreshing and cleansing first sip that captures the robust malt, but it moves quickly to a biscuit and pine combination that’s wiped clean in a flash of heavy rye spice that’s mildly abrasive (in a good way), swiping the screen away and passing to a super resinous finish that’s somehow both potent and quick to fade. The resin dwindles down to a milky, piney note that sticks around, but simply and without requiring a brushing of the teeth after a drink. Rye on the Prize is a nice blend of familiar red and IPA styles that breathes a little new life while still meeting all the expectations. The rye is used more as an accent than a defining characteristic, while the red malt and pine hop character of an IPA interplay at its base. For better or worse, the use of rye has come to mean “spiced” in a lot of beer vernacular, but here it’s a characteristic of depth that weaves into the already solid body of Rye on the Prize. It’s a steady everyday beer that’s versatile with a variety of foods, though a bit high on the alcohol content, being an imperial and all, to truly consider it a “go to” on a daily basis. Hence it’s bomber packaging. While it doesn’t reinvent the red IPA, it’s a solid and distinct addition that highlights what makes beer so damn intriguing in the first place. Even when a style suggests you know what you’re getting, it’s always something just a little bit different.